Art of Pens: JINHAO 159 (with HERO 204 BLACK INK) = SUPER CHEAP COMBO! JINHAO 159 (with HERO 204 BLACK INK) = SUPER CHEAP COMBO! 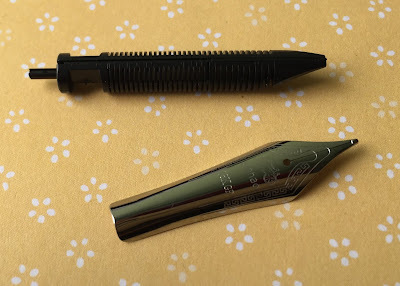 *If you have not already read my review of the Jinhao X750, please do so here, as I will be making reference to some of the previous observations (about Jinhao Pens) that I had made therein. 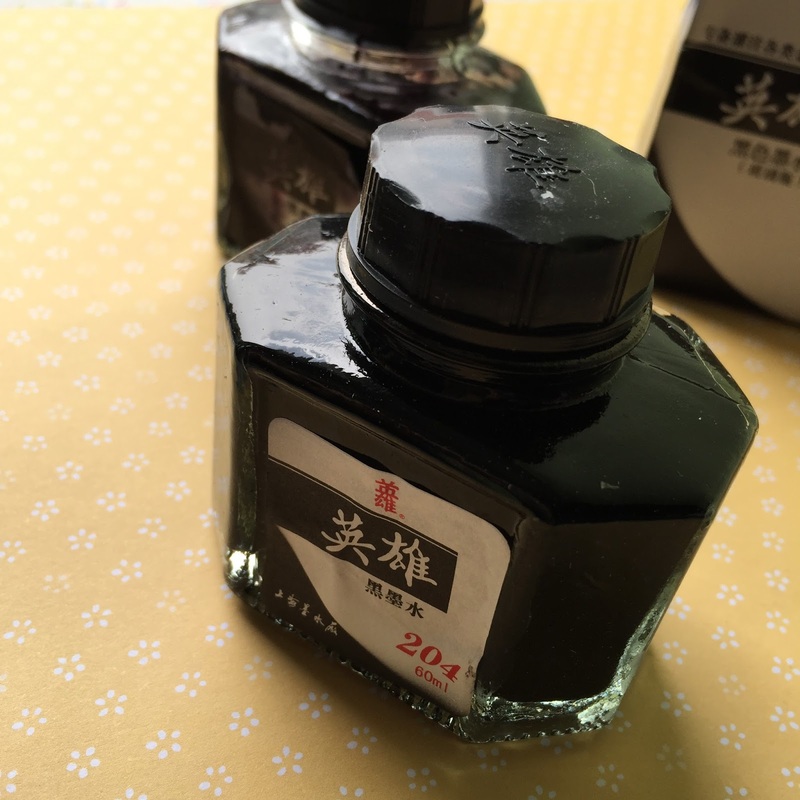 My first introduction to the Jinhao brand was when I stumbled upon the X750 in a Duyi Bookshop. I was impressed by the performance of the X750, and I grew to like Jinhao as a brand more and more. To me, Jinhao pens carry with it the promise of offering good writing instruments at very affordable prices. My fascination with Jinhao led me, no - compelled me, to buy a 159. About 6 months back, I purchased my 159 through ebay and paid only S$5.00 for the pen. If I recall correctly, even the postage (from Hong Kong to Singapore) was waived by the seller. The 159 took about 2 weeks to be delivered to me, and I was filled with anticipation to get my hands on it during those 2 (long) weeks of waiting. The 159 did not disappoint, not in the least. I thought I already knew what to expect with the 159 (given my previous experiences with my X750), but I have to say, when I first wrote with my 159, I was once again pleasantly surprised by how good and smooth a writing experience I got from the 159. Jinhao, is Han Yin Pin Yue for "金豪" which can be transliterated to mean "Prosperous". There is even a fountainpennetwork thread here which discusses the various different and possible meanings of what Jinhao could mean in English (one such alternate transliteration even states, jokingly, that Jinhao stands for "Gold Oyster"). The 159's barrel is made of metal (likely brass) and is coated with lacquer. It also comes with a screw-on cap (unlike the X750, which has a snap-on cap). The 159 can be posted, and the cap fits snugly onto the rear of the barrel. 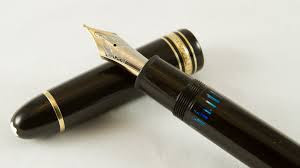 But the cap is extremely heavy and when posted makes the pen extremely long. Posting the 159 therefore makes it very unwieldy and difficult to write with (see picture below). 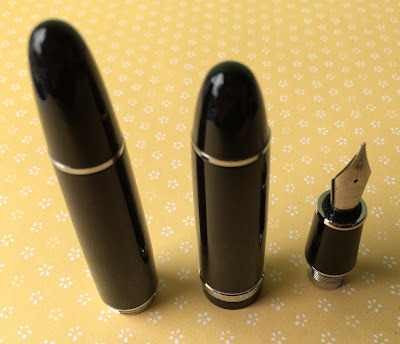 Much has been said about how the 159 resembles the Montblanc Meisterstuck (particularly the 149) (see Mr Brown's Fountain Pen Shootout video here, wherein he had compared both the 159 and 149 in unison). In this regard, I believe its more of a case of "the-ultimate-form-of-flattery-is-mimickry" rather than a sly attempt to dupe people into thinking or mistaking the 159 for the 149. This is because there are very obvious differences that distinguish the pens from one another. For example, the 149 is a piston-filled fountain pen (see picture above - wherein a ink-viewing window is visible in the barrel of the 149), and the 159 is a cartridge/converter-filled fountain pen. 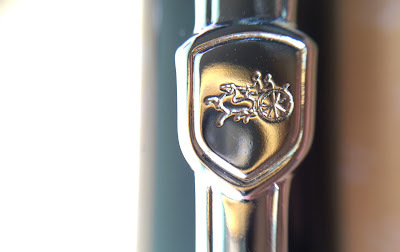 Furthermore, both pens are marked with their distinctive logos - the Montblanc with its iconic white star atop the cap, and the Jinhao logo atop a "shield" on the clip of the pen. As I said before (in my X750 post), the 159 looks undeniably classy and elegant. It looks impressive and expensive (even though it costs less than S$5!). Which is probably why scammers on carousell try their luck, hoping to trick an uninformed buyer into buying a 159 for S$150 (see picture below). Besides the overall look of the 159, there are also some other minor details that I really like about the 159. For example, the very simple manner in which the model number is engraved into the silver ring at the end of the cap (see picture below). 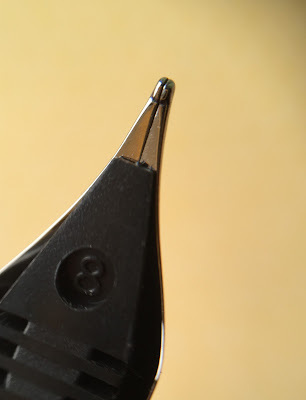 The nib and feed of the 159 are unremarkable (i.e. not particularly interesting or surprising). You get a shiny steel nib, with a nondescript black plastic feed. 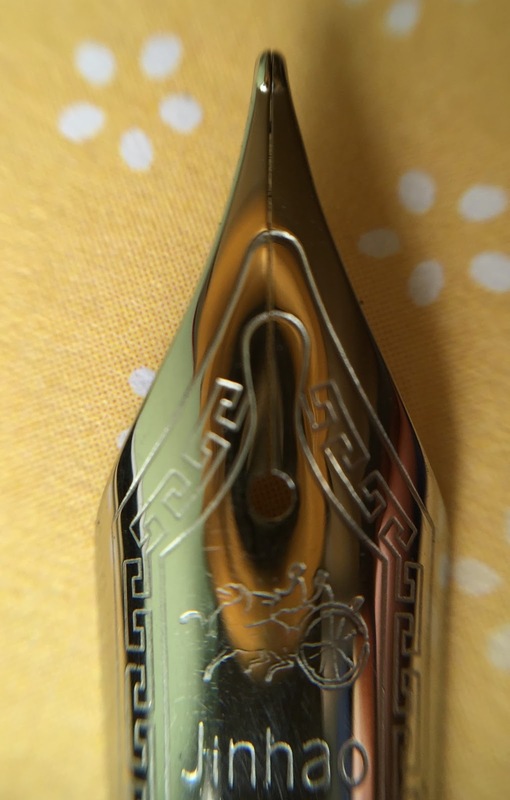 The one thing about the nib, which continues to irk me are the words "18K GP" engraved onto the nib (as all other Jinhao nibs). I was under the impression (given that the 159 is sometimes regarded as a blatant ripoff of the 149) that this was another attempt by a Chinese manufacturer (which they are infamous for) to pass-off its goods for something it is not. But as Mr Goulet points out in his 159 review here this is not the case. Instead, as Mr Goulet explains, it is because Jinhao does in reality have "18K GP" (i.e. 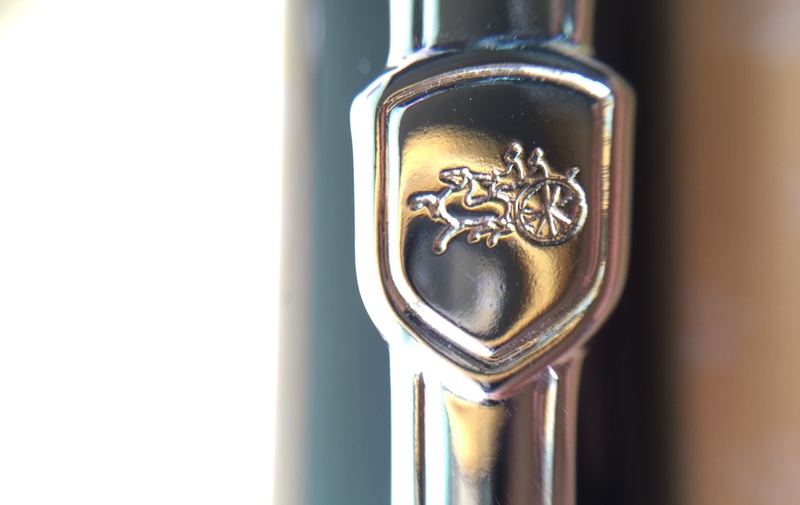 18 Karat Gold Plated) two-toned nibs, and all their steel nibs are therefore first stamped with the words "18KGP". This, I assume, is due to the manufacturers being indifferent (and/or too stingy to splurge on extra machinery) to having two sets of nib-presses to clearly distinguish their "non-gold-plated" nibs from their legitimate gold-plated ones. Therefore the (mis)representation is more so "unintentional" than "deliberate" on Jinhao's part. 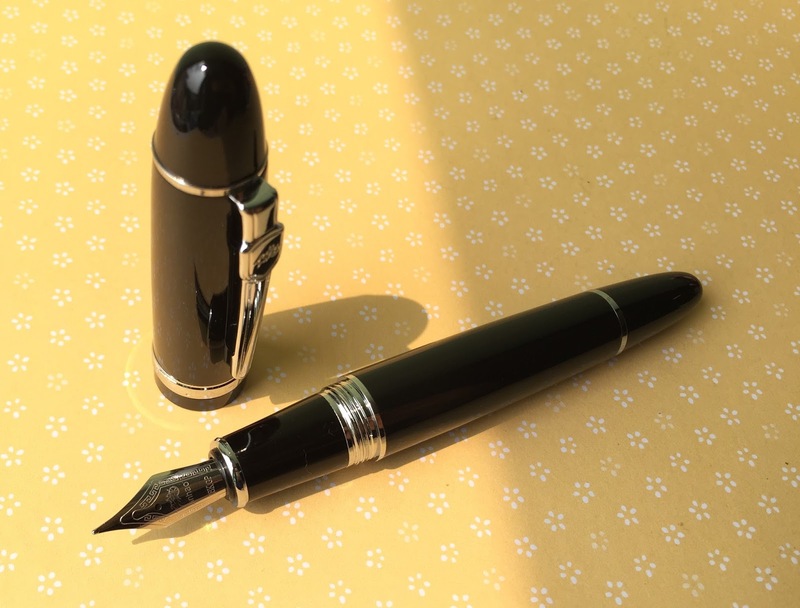 I guess my gripe with this whole "18K GP" issue simply boils down to the fact that this would be another potential reason scammers (like the ones already on carousell) could use to cheat unassuming fountain pen beginners, into forking out more monies than would be considered a fair price. Not to belabour my point any further, to round-off, I will just issue to all my readers (no matter how experienced a fountain pen user/collector you are) one final cautionary statement: never impulse buy a fountain pen, always do your due diligence first (especially online, where there is a wealth of helpful literature to help you come to an informed decision about whether to (a) buy a pen and (b) what price you should rightfully pay for it). My 159 came with a nice, big and juicy No. 6 sized (medium) nib. As you can see from the picture above, the tines of my 159 came nicely aligned. I therefore did not have any problems with the dreaded curse of "poor quality control", which many mass-manufactured Chinese pens are afflicted with. In fact, my 159 wrote wet and smooth right out of the box (inked-up with Pelikan 4001 Royal Blue). I did not have any issues with "skipping" and I found that the feed kept up nicely, and delivered ink at a constant rate, even when writing fast and furiously. For a S$5.00 pen, the 159 undoubtedly blew my mind the first time I put the nib down onto paper. Recently, my wife had also purchased 3 bottles (60ml each) of Hero 204 Black Ink from taobao for me (I have difficulty navigating around taobao, given that it's entirely in Mandarin). From what I understand, each bottle cost about S$1.00 only (or about 4.5 - 5 Chinese yuan each). 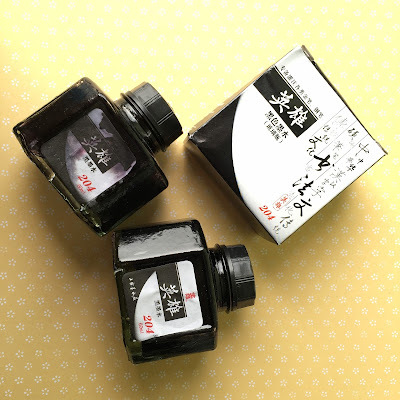 One should bear in mind that the Hero 204 ink is not an exceptionally good ink, in fact, when I inked up my 159 with it, I did experience a slight deterioration in the overall smoothness of the writing experience. 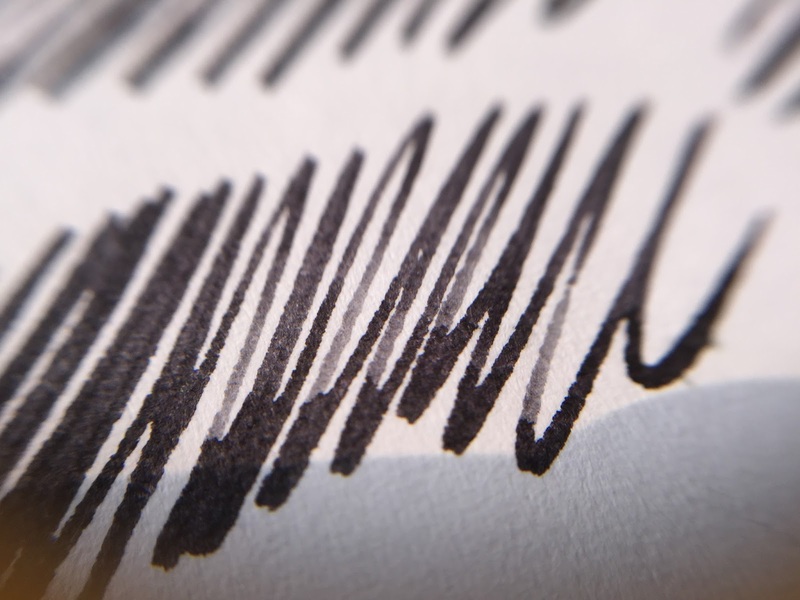 This would be what ink aficionados would refer to as a lack of "lubrication" in the ink. Also, as with the other Hero inks I discussed (per my X750 review), the Hero 204 also has an extremely strong stench (i.e. the same smell as Chinese water-colour paint). For a more in-depth review of the Hero 204 black ink (with a better writing sample to boot) see bookworm2109's fountainpennetwork thread here. 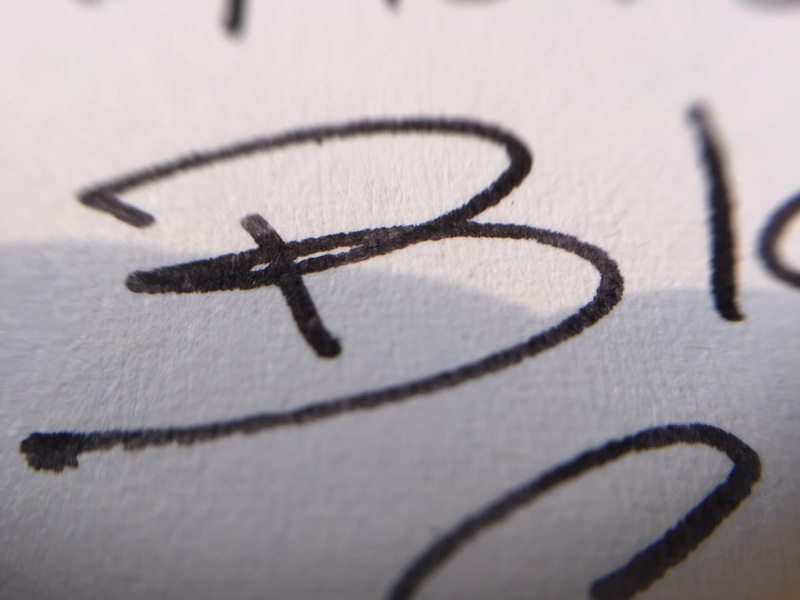 Also, if you are not a fan of "shading" in your inks, then the Hero 204 is probably not for you. As you'll note in the macro shots of the writing samples below, you'll see some shades of grey amongst the stronger black lines. 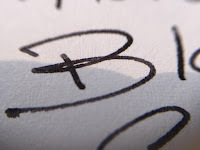 A common theme that traverses all my posts is the belief that a good fountain pen need not be expensive, and conversely an expensive pen is not necessarily good. "Good" being in italics because this of course is a matter of subjectivity. 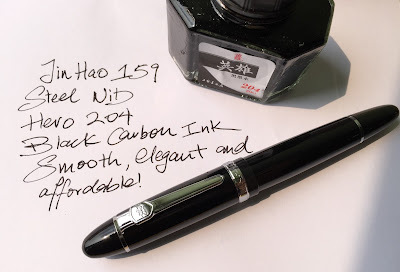 The Jinhao 159 is the epitome of this belief, for me at least. It is extremely cheap, and it delivers (for its price) an extremely good writing experience. 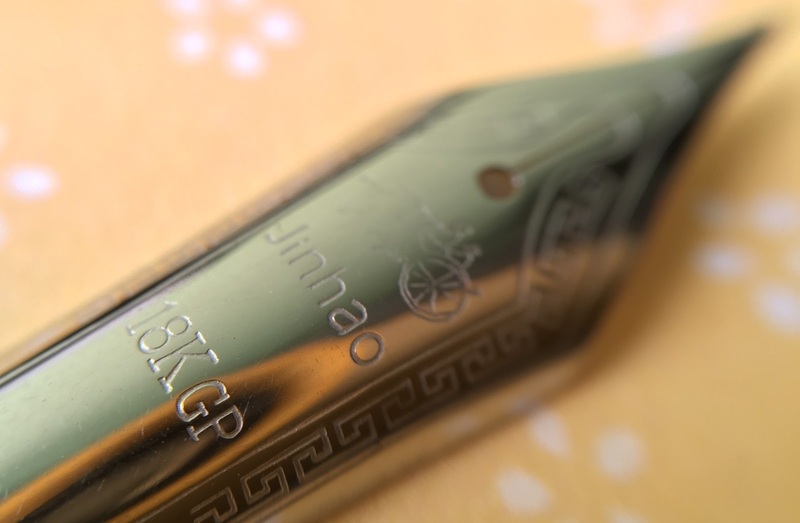 4) Jinhao is growing to be a "reputable" brand (but usually known for how cheap their pens are, or how closely their pens resemble their more famous counterparts), and is therefore not a "prestigious" luxury brand. In summation, the 159 is definitely a pen that I would recommend. 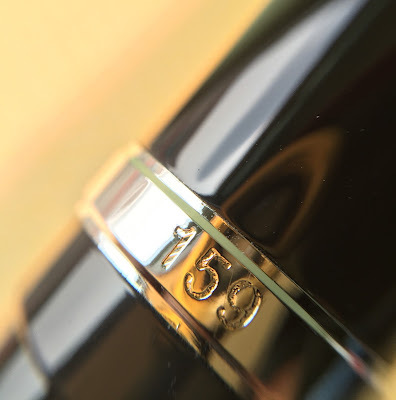 If you have low expectations for a S$5.00 pen, you'll be pleasantly surprised, and even if you had high expectations for a S$5.00 pen, your expectations will still be exceeded.